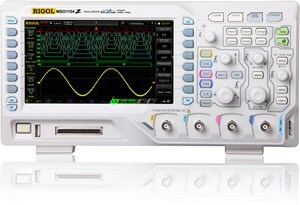 MSO1000Z Rigol Oscilloscopes ! !Special Offers!! The new Rigol MSO1000Z Oscilloscopes feature 4 channels and professional measurement functions at value pricing, making them attractive for educational and private use. All devices are equipped with the same well constructed and intuitive operational menu providing extensive functions as found in bigger and higher priced models. All models of the MSO1000Z series are equipped with 4 channels, a sample rate of 1 GSa/s, a storage size of 12 Mpts and a 7” (17,8 cm) TFT color display, as well as professional measurement, mathematical functions and an additional built-in 16 channel logic analyzer. You can choose between 2 ranges of bandwidth: 70 and 100 MHz. In addition to that, the “S”-models are equipped with a built-in 2 channel waveform generator at 25 MHz (200 MSa/s). Rigol alternatively offers the DS1000Z series without the additional built-in 16 channel logic analyzer. Serial decoding (RS232, I²C, SPI), advanced trigger options (Windows, Nth Edge, Video / HDTV, Delay, TimeOut, Duration und USB) and recording features can be added per software code. Additionally, the storage size can be upgraded from 12 Mpts to 24 Mpts by using a software code too. High quality 4 channel oscilloscope with 70 MHz bandwidth, 1 GSa/s and 12 Mpts memory depth, with integrated 16 channel logic analyzer and 17.8 cm LCD display (800×480 pixel). 4 probes PVP2150 (bandwidth 150 MHz), logic analyser cable with 16 logic probes, USB cable, pc software, power adapter and quick manual. High quality 4 channel oscilloscope with 70 MHz bandwidth + 2 channel waveform generator with 25 MHz bandwidth, 1 GSa/s and 12 Mpts memory depth, with integrated 16 channel logic analyzer and 17.8 cm LCD display (800×480 pixel). 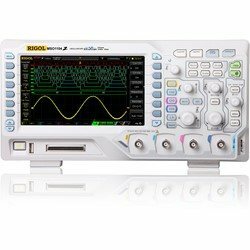 High quality 4 channel oscilloscope with 100 MHz bandwidth, 1 GSa/s and 12 Mpts memory depth, with integrated 16 channel logic analyzer and 17.8 cm LCD display (800×480 pixel). High quality 4 channel oscilloscope with 100 MHz bandwidth + 2 channel waveform generator with 25 MHz bandwidth, 1 GSa/s and 12 Mpts memory depth, with integrated 16 channel logic analyzer and 17.8 cm LCD display (800×480 pixel). 4 probes PVP2150 (bandwidth 150 MHz), logic analyser cable with 16 logic probes, USB cable, power adapter and quick manual.